NPR Clarifies Cokie Roberts' Role After Anti-Trump Column : The Two-Way The veteran commentator co-authored a column calling on "the rational wing" of the Republican Party to prevent Donald Trump's nomination for president. 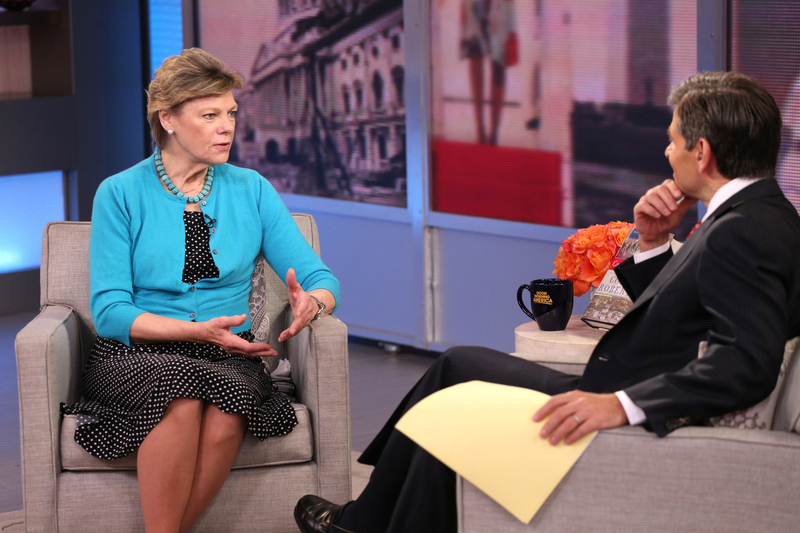 Cokie Roberts talks about her book Capital Dames on ABC's Good Morning America with George Stephanopoulos last April. Roberts left her position as a full-time staffer at NPR in 1992 but has regularly appeared on the air as a commentator. NPR is acting to clarify the role of longtime analyst and commentator Cokie Roberts after she co-wrote a syndicated newspaper column calling for "the rational wing" of the Republican Party to stop Donald Trump's march toward its presidential nomination. NPR has a policy forbidding its journalists from taking public stances on political affairs. She has not been a full-time employee for decades, and several years ago Roberts officially was named a commentator. (The timing was confirmed in separate interviews with Roberts, NPR officials and the former senior vice president for news who made the decision.) The role gives Roberts more latitude to express opinions than the network's reporters or hosts. "[Trump] is one of the least qualified candidates ever to make a serious run for the presidency," Roberts wrote late last month in a syndicated column with her husband, the journalist Steven Roberts. "If he is nominated by a major party — let alone elected — the reputation of the United States would suffer a devastating blow around the world." Roberts, often described as a "founding mother" of NPR, left her position as a full-time staffer in 1992 for ABC News. She continued to appear regularly on NPR as a news analyst for almost two decades on a contract basis. After the change in title from news analyst to commentator, listeners may have noticed little, if any, difference in her role. Roberts remains closely identified with NPR and presents commentary most Mondays on Morning Edition. Roberts' column was published Feb. 26, and she did not flag its contents to NPR executives. It came to their attention after Roberts sharply questioned Trump during a March 9 appearance on MSNBC. NPR's senior vice president for news and editorial director, Michael Oreskes, said the opinion column indicates Roberts has not been sufficiently identified to listeners as a commentator. Additionally, he wrote in a memo to staffers that news executives would work with her to refine the contours of her job. The very public evolution of Roberts' status occurs against the backdrop of an earlier episode in which an NPR analyst's remarks in another news outlet sparked a firestorm. NPR drew a backlash when it terminated Juan Williams' contract in fall 2010 because of comments he made about Muslims on Fox News. The greater context involves Trump himself. As Oreskes noted, the news media continues to wrestle with how to respond to Trump. His spectacular and unsettling rise rests in part on rhetoric that has seemed to incite violence and racial tensions. Oreskes directed Roberts to explain her reasoning behind her column — both the substantive case and Roberts' conviction she had a right and need to articulate it — in a conversation with Morning Edition host David Greene broadcast early Monday. "Our journalists have clear instructions," Oreskes wrote in his memo, sent to staffers Monday morning. "We do not support or oppose candidates. We don't advise political parties. We gather the news and seek as many points of view as we can. Cokie's role has evolved into being one of those points of view." In the Morning Edition interview for broadcast Monday, Greene asked Roberts: "Objectivity is so fundamental to what we do. Can you blame people like me for being a little disappointed to hear you come out and take a personal position on something like this in a campaign?" "If I were doing it in your role, you should be disappointed," Roberts said. "Or if I were doing it covering Capitol Hill every day. I can't imagine doing that. But the truth is [that commentary] is a different role. And there are times in our history when you might be disappointed if I didn't take a position like that." Roberts is not the only veteran journalist to take unusual exception to Trump. In a pointed commentary that aired on NBC Nightly News in December, retired NBC anchor Tom Brokaw denounced Trump's "dangerous proposal" for Muslims to be prevented from entering the country. Brokaw, now a senior news analyst for NBC, said it "overrides history, the law and the foundation of America itself." "Here is my basic approach to life," Roberts continued. "I am a totally unpartisan human being. I don't care which party has the right ideas — or which party has the wrong ideas. I am very, very, very interested in civility. I am interested in government working." Roberts cited her family's own dedication to public service — not just the congressional careers of both of her parents but, she said, a family tradition reaching back to the American Revolution. Roberts particularly pointed to Trump's sharp rhetoric on Mexicans and Muslims and his seeming encouragement of violence toward protesters. "We are in a time where we have the possibility of going backward instead of forward," Roberts said. "What's so incredibly wonderful about this country — which I believe is great and does not need to be made great — is our constant infusion of new people with new energy and new ideas. "I know about the dark times in our history where we have gone backwards," Roberts said. "Those have not been useful times in our history. Not to point out that this is a moment in history where we could be backward instead of forward might be a disservice."